The inept American president, Stacy Anne Barbeau, has failed to account for the Russian threat. 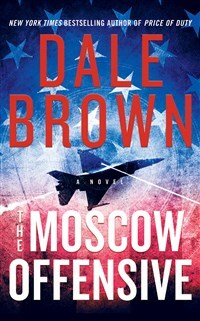 Top-notch aviator Brad McLanahan and the elite Iron Wolf Squadron have joined forces with the Alliance of Free Nations in Eastern Europe to prepare for the imminent horrifying attack. Working with cutting-edge technology, the team will expertly pilot CIDs (Cybernetic Infantry Devices)—twelve-foot-tall humanoid combat robots—each armed with more firepower than a conventional platoon. But their state-of-the-art weapons and honed battle skills may not be enough to stamp out this new menace. For the Russians have reverse engineered their own combat robots and they are smuggling them across America’s borders, planning to attack from within. McLanahan and the Iron Wolf Squadron will once again put their lives on the line to fiercely protect the home of the brave and the free world.